Back Panel and Right Side Panel. Note positioning of external reverb attachment screws, which varies in different Hilgen examples. External footswitch input is located to the upper right of reverb screws. Lower Chassis. Note printed circuit board on the left end of the chassis. 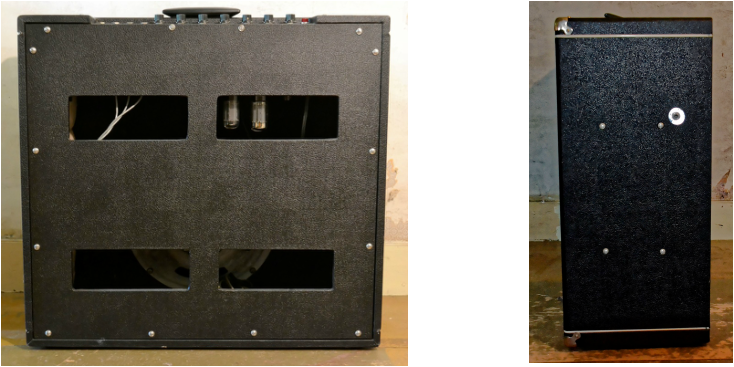 It appears that each time Mr. Gentul upgraded a single-channel amplifier to a dual-channel design, he added a printed circuit board to allow the additional pre-amp tubes to be mounted within the width of the single-channel chassis. Despite popular bias against PCB circuits versus point-to-point wiring, I have noticed no difference between the two designs in terms of sound quality or reliability.